One of the biggest causes of damage to tennis courts is poor management of moss. Tennis court fences remove the need for hedging and deter moss. Merely blasting water at high pressure on to the top of your tennis court actually makes the problem worse. Maintaining your court goes to the heart of what makes our tennis courts great. The original En-Tout-Cas courts became world famous because they were the first synthetic court that drained so well that the court was playable in rain or shine. The advantage lay in the fact that the base of the court drained so well after rain that the court was soon playable again. That was in 1909 and it’s still raining here in the UK. With average UK rainfall, your court’s playing surface alone will receive more than 500 tonnes of rainfall a year. What happens to that water is key to the long-term life of your court. A tennis court isn’t flat like a billiard table. It slopes to help water run off the surface. A synthetic court should be built with a very small slope in just one plane (side-to-side,or end-to-end ) of up to one per cent. That’s only about 350mm over a court length of 35m. The slope can’t be any steeper because it would spoil the game. That one per cent slope isn’t enough to get rid of all the water, (for example, a flat roof has a three per cent slope). So our courts are porous. The rain drains from the surface through irrigation voids. As long as the voids stay clear, the court will drain efficiently. We build high-quality tennis courts that will last for years - with the correct maintenance. However, over time, unmaintained courts inevitably become dirty and mossy. Effective professional cleaning will keep the voids clear of blockages. Poor cleaning will damage your court. It’s as simple as that. One of the biggest causes of damage is poor management of moss. Moss can present a serious threat to the long-term life of your court. However, it can be defeated if tackled in the correct way. Mosses are common throughout the UK – there are thousands of varieties – and they thrive in clumps and damp, shady locations. Unlike grass, mosses are typically just one cell thick. They don’t produce seeds but spread through the growth of spores. Left alone on a court they will spread and create a slippery and unsafe surface. Where and why does moss grow? Moss can thrive on artificial grass or on porous tarmac just as it can on natural grass. Its growth is often an indication of a deep-rooted problem in the court. Killing the moss is just the first part of the solution. The next step is to remove its favoured environment. Moss will tend to appear and grow where artificial grass has become dirty or where sand has clogged up the voids in tarmac. Being just one-cell thick, mosses have no vascular systems to carry water through the plant. Instead, they need a damp undrained habitat and prefer water that is either acidic or alkali rather than pH-neutral. Shade from trees or bushes around a tennis court will create a happy home for moss. Planning your new court location in an open area can be key to benefiting from a long-term moss-free court. That’s one of the reasons we build courts with attractive tennis court fences, to make it unnecessary to surround it with a hedge. If you already have a court that’s shaded by trees, tree surgery will be your best option to get some sunlight and drying heat on to the court and discourage moss. So far so good. Having got some ultra-violet light on the court surface you might be tempted to blast away the dirt and moss with a power washer. We’ve seen numerous newspapers, magazine articles and comments from alleged professional cleaners, telling court owners to do just that. This article from the Daily Telegraph is typical of what we see. It advocates using a power washer as a Boy’s Toy or a macho diversion, and disregards the long-term damage to the court. The problem is that merely blasting water at high pressure on to the top of your tennis court actually makes the problem worse. Debris is driven or washed down into the surface of the court, where it clogs up the drainage voids with dirt, nap off the tennis balls and dead moss. Drainage is impeded and the next time it rains the court stays wetter longer – and the moss returns and thrives quicker than it did before. Meanwhile the water and dirt sit below the court surface in the drainage voids until winter comes and the temperature drops. When the water in there freezes, ice expands and damages the court by driving chippings out of the surface. Where you once had a dirty court, you now have a damaged one. This is actually the most common cause of failure in hard tennis courts such as Pladek and Matchplay. Cleaning with specialist equipment rather than blasting with a power-washer is the answer. When we clean a court, we remove the surface debris and clear out the blocked voids. Our cleaning will restore the porosity and prevent the court surface disintegrating with winter frost. 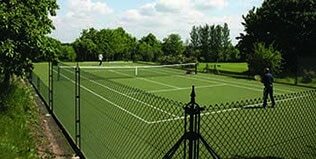 Synthetic grass tennis courts such as Tenniturf, Sporturf and Savanna can be kept moss-free by brushing with a rotary brushing machine every month. A properly cleaned court is clean, safe and will deter further moss growth. Moss, as we all know, doesn’t grow on a rolling stone – or a clean well-drained court.